Expedia can help you save heaps with Historic Old West End travel packages. With all that extra cash in the bank, you might even like to book a few extra nights. Secure your deal on Expedia and gain savings of up to C$590*! It really is that easy! With more than 400 partner airlines and 321,000 properties worldwide, our global database can get you to your ideal vacation spot. Almost all accommodations can be cancelled without any additional fees from us. Feeling excited about your trip to Historic Old West End? Keen for some recommendations about what to do and see when you get there? That's where we can help! The Toledo Museum of Art is a well-known sight that's just outside your door. So why not pull on your sneakers and sunglasses and mosey on down there? Attended for public worship and private times of prayer, Queen of the Most Holy Rosary Cathedral is a celebrated holy landmark. That said, you don't have to be a devout church-goer to check out this peaceful place. Travelers have a wonderful selection of things to do in this destination. Great theater challenges our way of thinking and asks us to aspire to bigger things. Catch a show at Children's Theatre Workshop and open your mind to some new ideas. Still have time to spare? The care of native animals and plants is hugely important. Get lost in the tranquility of nature at Irwin Prairie State Nature Preserve and see what animals you can spot. When it comes to places to stay in central Historic Old West End, you can't afford to be choosy. However, you'll still have access to 21 properties in the surrounding areas. With Expedia, arranging luxury getaways and cheap vacations is a breeze. 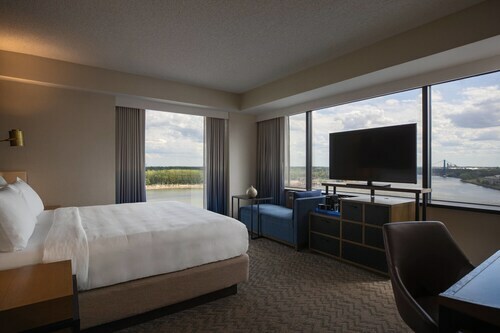 At the Hampton Inn & Suites Toledo/Westgate (3434 Secor Road) and the Holiday Inn Express & Suites Toledo West (3440 Secor Road), you'll get to enjoy a snug bed and a hot shower — just what you want after a big day! From the very moment you file off the plane at Toledo Express Airport (TOL), you'll know your extraordinary trip to Historic Old West End is underway! Well, the center of the neighborhood will still be 14 miles (23 km) away, but close enough. 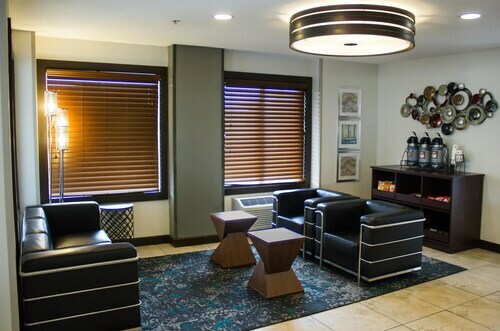 Located in Downtown Toledo, this hotel is within a 5-minute walk of Seagate Convention Center and Huntington Center. Fifth Third Field and Imagination Station are also within 10 minutes. Toledo Station is 17 minutes by foot. Located in Downtown Toledo, this hotel is within a 10-minute walk of Imagination Station, Seagate Convention Center, and Huntington Center. Valentine Theater and Fifth Third Field are also within 15 minutes. Toledo Station is 25 minutes by foot. Located in the heart of Maumee, this hotel is within 3 mi (5 km) of Maumee Antique Mall, Maumee Sports Mall, and Lucas County Recreation Center. Stranahan Theater and Side Cut Metropark are also within 6 mi (10 km). Situated in Toledo, this hotel is within 3 mi (5 km) of University of Toledo, Wildwood Preserve Metropark, and Glass Bowl. Stranahan Arboretum and Toledo Botanical Garden are also within 6 mi (10 km). Situated in Maumee, this hotel is within 3 mi (5 km) of Maumee Antique Mall, Maumee Sports Mall, and Lucas County Recreation Center. Stranahan Theater and Side Cut Metropark are also within 3 mi (5 km). Situated in the historical district, this hotel is within 9 mi (15 km) of Fort Meigs Ohio's War of 1812 Battlefield, Huntington Center, and Seagate Convention Center. Toledo Zoo and Side Cut Metropark are also within 9 mi (15 km). Situated in Perrysburg, this romantic hotel is 3 mi (4.8 km) from Fort Meigs Ohio's War of 1812 Battlefield and within 6 mi (10 km) of Side Cut Metropark and Lucas County Recreation Center. Stranahan Theater and South Toledo Golf Club are also within 9 mi (15 km). Situated in Toledo, this hotel is 1.7 mi (2.7 km) from South Toledo Golf Club and 2.7 mi (4.4 km) from Toledo Zoo. Swan Creek Preserve Metropark and Stranahan Theater are also within 3 mi (5 km).